I received some fabulous apparel from Balini Sports to review recently. I sent them my measurements and my standard size. However, with my growing belly, I wasn't sure I was going to be able to squeeze into their apparel before the end of the year. Wrong! I squeezed right in. When I looked at their apparel online, everyone pictured was fit and trim and pretty thin. I honestly wasn't sure if their apparel was going to be a good fit with my curvy, mamas body (that is now expanding more day-by-day with #3). However, I really (REALLY) like their stuff. Some of their pieces are a little too revealing for my personality and body-type. However I think they are adorable for someone that is willing to flaunt what they've got. These Yogini Yoga Capris are amazingly soft. I was sent a size 8 and typically wear a size 8 pant. These are available in five sizes from XS to XL and are available in black or purple. The purple were something really fun for me to try. I also love mixing and matching my bright running gear with contrasting colors, so I paired it with a great top. I honestly couldn't get over how soft they were. Yogini Yoga Capris is designed with comfort in mind, it comes in 2 colors. Royal Purple and Black. Stylish active wear yogi pants wrinkle gathering provides a simple elegance that adds a touch of sophistication to your workout. If you practice hot yoga you need these yoga capris in your collection. Our yogini slim capris is designed for high performance, lightweight design, and rapid drying for maximum comfort in even the longest hot and bikram yoga sessions. Four way stretch for your practice, 1 second moisture wicking, Nylon Spandex for extra softness, flat lock gusset to avoid camel toes. I loved the detail on the sides of the waist band and the gathering at the bottom of the capri. It was really flattering and comfortable. These were super light and airy and perfect for a warm day like today. These capris are geared towards yoga. However I decided to take them out for a run. They fit great and were comfortable while walking. However, as I started to pound out the miles, I was complaining (and giggling) to my husband as I had to keep pulling them up over my belly and my sides during our first mile. I thought I may have to cut the run short and head back home to change (or not continue our run). However, after a mile in and my big belly was sweaty they pretty much stayed in place for the last three miles and were comfortable during my remaining miles. Since I needed more room over my belly, I also hiked up the bottom of the capris, so that I would have more room at the top of the pant. I love these and hope to get a lot more use out of them next year, when I'm not pregnant. They are adorable and super flattering. The capris retail for $69.99 online. I also tried out the Miranda Sport Bra. I was sent a size 6 bra and typically wear a medium or large size sports bra. Again, this bra comes in both black and purple - to match the capris and also comes in five different sizes. This bra retails for $45.99 online. Miranda Yoga Bra is the improved version from our best-selling Miracle Yoga Bra, our new design gives a firm lift without wires that feels as good as it makes you look. After multiple revisions resulting from rigorous testing, we replace our stretch band with a specially engineered fabric that produces the same level of support without restricting your breathing. Women with enhanced breasts find they want to wear this bra inside the studio and out because the superior level of comfort and support. We are proud to say this is the best yoga bra ever created. This bra is again geared towards yoga, but I absolutely loved it for running. It gave me some lift and I even received a nice compliment from my husband while running! The bra wasn't restricting at all, yet I felt comfortable and in-place. It is super soft and there is a removable padded liner inside. I wasn't sure if I would like the criss-cross style for running and intense cardio, but it worked perfect. I also wasn't sure if I would like the bra closure in the back, as I don't typically run with sports bras with this style. But it didn't bother me in the least. I felt so comfortable in fact - that I'm willing to post this belly picture (above)!! 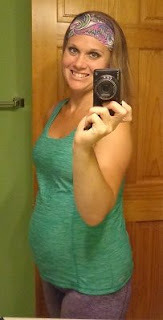 I local mother runner no longer needed this adorable maternity running tank. I am so touched that she thought of me and sent it my way. I have had this tank from For Two Fitness for a couple of weeks and it arrived right when my waistline was starting to expand - as I started my second trimester. Now I'm in week 15 and have already sported this tank a least a half dozen times. It is so soft and comfortable and is super long, flattering and fitted at the sides. I love this maternity tank and can't wait to purchase more! I receive so many great compliments on it at races and group runs. It makes me even more proud to be an expectant mother runner.